ON DISPLAY is an installation by renowned choreographer Heidi Latsky that serves a deconstructed art exhibit/fashion show and commentary on the body as spectacle and society's obsession with body image. It turns a cast of diverse and extreme bodies into a sculpture court where the performers are the sculptures. ON DISPLAY began as a simple human sculpture court and is now a movement, a growing portfolio of works that explore and demonstrate inclusion through art. As part of International Day of Persons with Disabilities, NYU Tisch School of the Arts hosted On Display Global: Impact through installations on December 2nd and 3rd in New York City. Working in collaboration with Heidi Latsky, NuVu students designed wearables for four of her performers for On Display Global. On Display uses fashion as a tool of social justice aiming to celebrate the beauty of difference. Each performer has a disability and teams of NuVu students worked closely with each of the performers to design individualized wearables that highlight a passion, experience or personality trait. The task at hand was to make a wearable sculpture for Jerron, a performer in the “On Display” art exhibit, that expressed his interest in hemispheres, while showing strength, ferocity, totality, completion, and solidness. 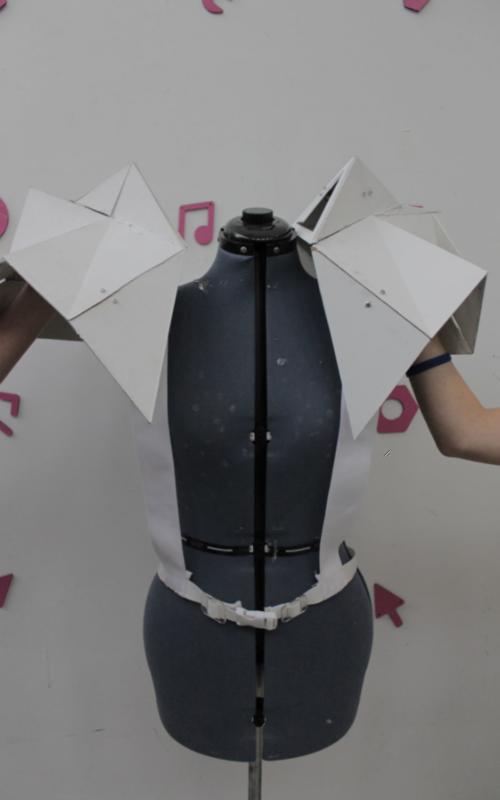 To accomplish this we tried to make all white low poly shoulder pads with moving flaps on one of the pads to show the subtile differences between hemispheres. When pulled by strings attached to his hand, we wanted these flaps to rise and fall so that his body movement could be coordinated with the movement of the shoulder pads. This would show the small differences between two hemispheres, while also showing their many similarities. Jeron Herman is a dancer and performer, who has cerebral palsy in the left side of his body. When talking to him he spoke of how he has a different relationship to his right side of his body than he does with his left. We wanted to make a piece of art that showed how the two hemispheres, or sides, of his body are almost the same, except for wonderful differences between the two that make them each unique. We decided that the way we wanted to express the differences between the hemispheres was through movement. The low poly exterior of the shoulder pad we were able to make sits on top of a notched bridge. This bridge rests on top of the shoulder and is connected to the low poly layer through notched pieces of wood. If we had more time on this project we would have made flaps, or windows, inside of some of the triangles that would have been attached to strings. Jerron’s hand would have been attached to the other end of the strings so that when he moved his arms and body, the flaps for the triangles would move up and down correspondingly. This would have been the subtle difference between the two sides. The first step in our creative process was talking to Jerron. Later on, we started to brainstorm, and in the beginning we were thinking about doing something with Yin and Yang, but it was pointed out to us that Yin and Yang represents so many things, some of which, possibly, have nothing to do with Jerron’s personality. After brainstorming ideas with a coach, she recommended the idea of shoulder pads, and we decided this was the direction we wanted to go in. The reason the idea of shoulder pads worked was because when talking to Jerron he had mentioned that he felt strong when he felt the movement in his back, and shoulder pads would not limit that movement . We then made a prototype by arbitrarily assembling triangles into a low poly design. We then moved on to laser cutting triangles in Rhino, with the help of a coach, that, when assembled, would make the final low poly exterior. We had a hard time with this because it was taking too much time to assemble the triangles due to the fact that we had over 100 of them. It was also taking too much time to assemble them at right angles so that they would make the shape of the shoulder pad. We then took the route that we and our coaches thought would be more efficient. Our coach assembled the design for us in 123D make and added numbers, perforated lines, and tabs that we all thought would help with assembly, however, the numbering came out wrong so we did not use this method. Throughout the process we also worked on making the notched bridge that would rest on Jerron’s shoulder, serving as a way to attach the low poly exterior to the shoulder while keeping Jerron comfortable. In the end we spray painted both pieces and attached them with hot glue because wood glue would not effectively attach two pieces of painted wood together. As mentioned in the previous paragraph, we had much trouble with the design and assembly of the low poly exterior, but this was not the only challenge we faced. We were also faced with the challenge of attaching the low poly layer to Jerron. We had the idea of creating a mold to his shoulder and to the inside of the low poly layer, but this seemed impractical in terms of the materials we had. We eventually used the bridge as the bottom layer on which to attach the low poly exterior. We were also presented with the challenge of making the wearable move. At first, one of our coaches thought it would be interesting to use servos to make the triangles move if someone approached Jerron. Later on we came up with the idea of having the triangles pop out and move. Our coach thought that it would be interesting for the triangles to be attached to strings that jerron could control, so we stuck with this idea. Unfortunately, we were unable to get to the moving part of the wearable, but if we had had more time, this is what we would have done. In our first iteration we haphazardly assembled triangles with glue to create a low poly shoulder pad. We were thinking about making two shoulder pads to show his interest in hemispheres, and wanted the two shoulder pads to be similar in most ways with very slight differences. When we were thinking about making two shoulder pads, one of our coaches recommended to us that we make one of the shoulder pads move to show the difference between hemispheres. For the second iteration we made the design of the shoulder pad exterior in Rhino. To do this, we put a model of a male torso in Rhino so that we could make a layer over the shoulder. Every time we thought we thought we were done with a layer, the feedback was to make it crazier. So every time we made it crazier until it was ready to go into Rhino. We then sent this file to one of our coaches and she used a plug-in for Rhino to make the low poly exterior that we wanted. The problem with the cut was that the numbers were very hard to read, and the triangles were hard to assemble, so one of our coaches offered to make the file using fewer triangles. Another Rhino file was then laser cut with fewer triangles, but it still proved very challenging to assemble because it was too difficult to figure out the angles at which to place the triangles. The final iteration was made in 123D make. This iteration was made of laser cut triangles that fit together according to how long their edges were. We used fabric tape to attach the triangles on the inside of the shoulder pad. After we taped everything together we went and spray painted the whole project white because all performers need to wear white in the exhibit. We then attached the exterior shell to the bridge with hot glue because one of our coaches told us that wood glue does not work as well when attaching painted wood together.